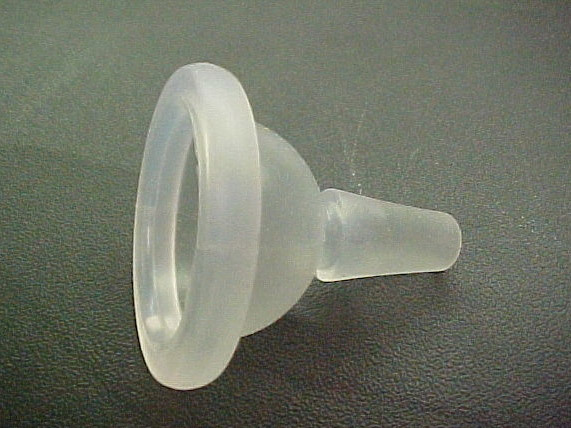 Lenard Tool & Machine, Inc. (LTM) was selected by a manufacturer of medical devices to create a high-performance mold for the production of the silicone cap highlighted here. 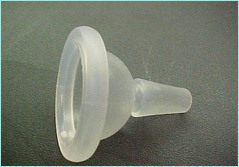 Initial product development revealed that the mold design would have to address the unique challenges posed by the geometry of the cervical cap. Mold design took place on CAD/CAM software, and integrated all of the complex customer specifications. The mold design LTM produced coped with these constraints by utilizing exploding cavity inserts and a flip-out core bar with cores attached, all constructed out of sufficiently hard-420 stainless steel featuring a RC of 50. Input and approval from the molder concluded the design phase. CNC milling, turning, surface grinding, and bead blasting were utilized to produce the mold. Tightest tolerances were held at ±0.0005" with cuff wall thickness of 0.010". Dimensional inspection and validation of functionality ensured proper operation and geometry in the produced design. LTM constructed a cost-effective and precise solution for this ostensibly simple, but difficult to mold silicon part. LTM's experience-driven design and innovation in addressing a critical roadblock provided this customer a quintessential experience where their needs were integrated into every step. This experience is one of many that reveal LTM's bottom line: an unparalleled ability to satisfy the customer's needs with efficiency, experienced engineering, and high performance. Contact LTM today to learn more.